Finally, some action is being taken to clean up the Silver Cemeteries of Panama. We hope to see more of this during the year. 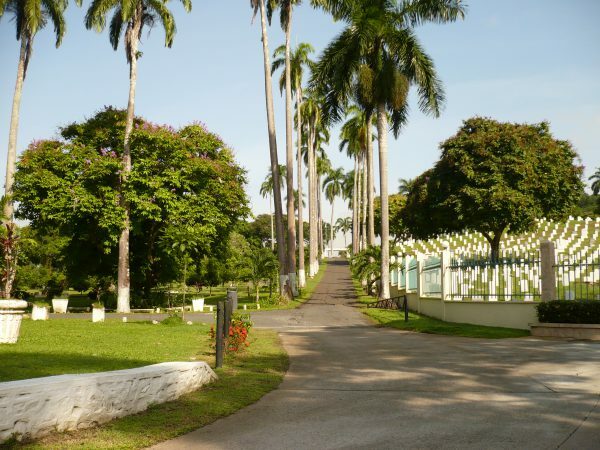 At this time, the grass is being cut by the Instituto Nacional de Cultura (INAC), but the individual attention to the graves needs to be accomplished (washing, cleaning, scrubbing, painting, etc.). So we are anticipating a massive turnout for those three days so that when we meet for the ceremony on Wednesday, November 2, the difference will be felt. You are encouraged to bring your own snack/lunch and the following items for the clean up: Water (both for drinking and for the clean up), gloves, scrub brush, a bucket, Clorox, white paint & brush. A HOLY DAY SET ASIDE FOR HONORING THOSE WHO HAVE DEPARTED THIS LIFE. IN MEMORY OF ALL THOSE WHO ARE BURIED IN THESE CEMETERIES. This entry was posted in Cemetery history, Corozal Cemetery, Mount Hope Cemetery and tagged Corozal Cemetery, Frances Williams Yearwood, Gatun Cemetery, INAC, Mt. Hope Cemetery. Bookmark the permalink.